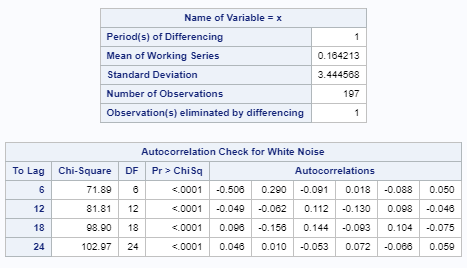 Differencing or transformation do not always remove all of the autocorrelation from the time series. 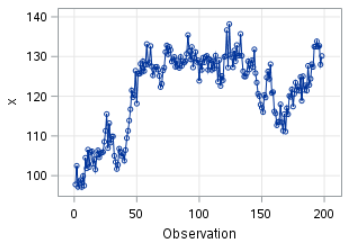 The TS2 data set is another non-stationary time series. Let's look at the results with one order of differencing. Let's look at the Ljung-box test result. The p-values at all four lags are less than 0.0001. We reject the null hypothesis that the residuals are white noise. There is remaining autocorrelation left in the residual that is not explained by our model. Now, what are we going to do next? 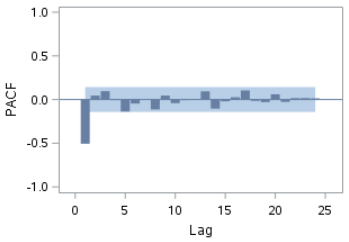 The PACF plot of the residual shows a spike at lag 1. This indicates that the residual at time t is highly correlated with itself at time (t-1). We can try adding an AR term to the model and see if it improves the residual. 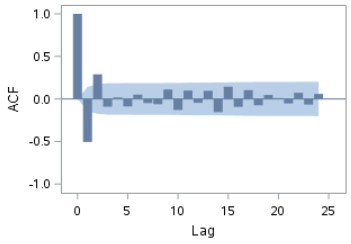 The AR (Autoregressive) model models the time series (X) based on the previous value of X (i.e. Xt-1). 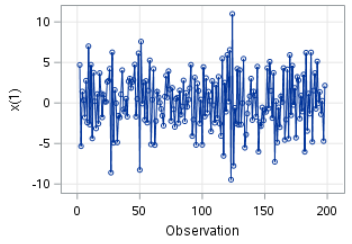 Let's add an AR term to the model and see if it improves the autocorrelation in the residuals. We have added an ESTIMATE statement with the p=(1) option. This specifies the number of AR terms (p). There are many results generated. Let's look at each of them individually. The first set of tables are the Ljung-box test results before adding the AR term. There are a number of tables that have important statistics. The p-value for (AR1, 1) is less than 0.0001. This indicates the parameter estimate is significantly different from zero. The next table shows the AIC and SBC for the model. AIC and SBC are used for model comparison purposes. The lower the AIC and/or SBC, the better. We will look at some examples shortly. These are the Ljung-box test results after adding the AR term. The p-values at each lag are above 0.05. We're done! We conclude that the residuals after adding the AR term are now just white noise. The model we have identified is ARIMA (1 1 0). It has one AR term with one order of differencing. Now, how do we know the ARIMA (1 1 0) model is better than the ARIMA (0 1 0) model that we had earlier? There are a number of ways to perform a model comparison. One common way to select a model is to compare the AIC and SBC values. The model with the lower AIC and SBC are usually the better model. The AIC and SBC for ARIMA (0 1 0) is 1048.36 and 1051.644, respectively. The AIC and SBC are 992.0088 and ​998.5752, respectively. Based on the AIC and SBC, the ARIMA (1 1 0) is the better model among of two. 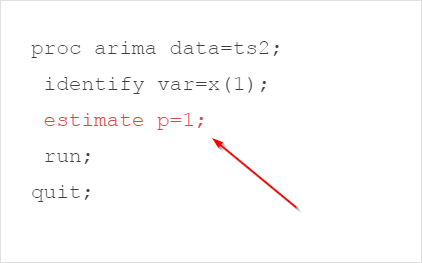 Another issue with the ARIMA (0 1 0) model, as we have mentioned before, is that its residual shows remaining autocorrelation that is not explained by the model. This indicates that there is a systematic pattern that could be explained by additional AR / MA terms. In the next section, we will look at an example where adding an MA term could improve the model from the stationarized time series. The ORDER data set contains the number of orders for a period of 100 days. Perform the necessary steps to identify one ARIMA model where the residuals are purely white noise.